Built 1892 by J. V. Hrásky and Ant. Hrúby, replacing a previous theatre (built 1867, destroyed by a fire in 1887). 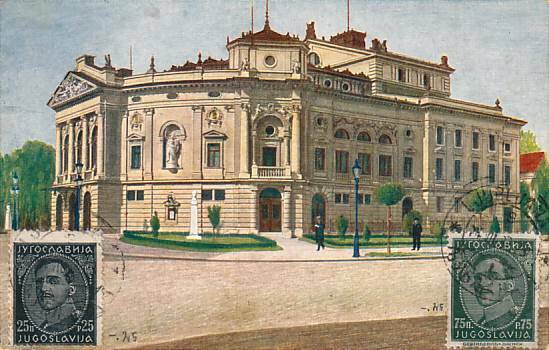 Opened 29 September 1892 with the historical drama, "Veronika Deseniska". 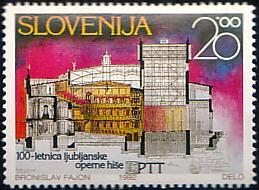 Originally used for opera and drama performances in Slovene and German. However, German performances were less frequent because they were boycotted by a patriotic Slovenian public. 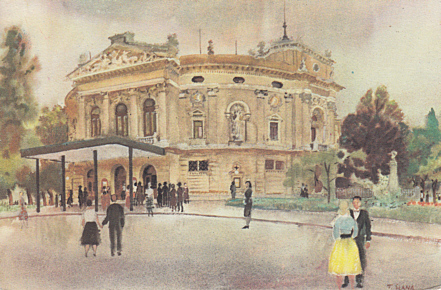 Later renamed "Slovensko narodno gledalisce - Opera in Balet" [Slovenian National Theatre - Opera and Ballet]. Currently used by the resident national opera and ballet companies. 700 seats. 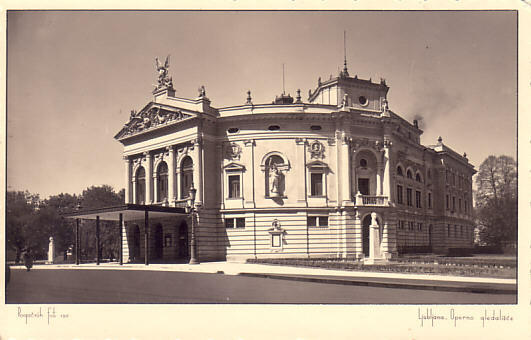 Reverse Text: "Ljubljana - opera"
Front Text: "Ljubljana - Operno gledalisce"
Reverse Text: "France Slana: Opera - Ljubljana - Slovenija - The Opera house of Ljubljana - Slovenia"
Not sent (but postmarked in 1961). Text: "100-letnica ljubljanske operne hise"